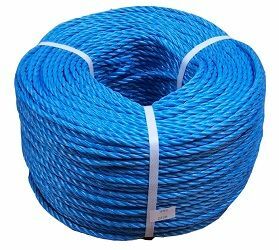 We provide a variety of different measurements for our blue polypropylene rope but our 220m is best for commercial uses. This versatile product can be used for almost anything. Not only is our polypropylene rope cheap, it’s one of our bestsellers because of its strength and versatility. We keep a large stock of these ropes to ensure we can provide you with the necessary amount. The UV treatment of our ropes guarantees them to last longer, avoiding weathering where some other ropes may suffer. Their high resistance to acids and alkalis, and their ability to float in water makes them the perfect choice for industrial purposes. Choose between 4mm, 6mm, 8mm, 10mm, 12mm, 14mm, 16mm, 20mm, 22mm, 24mm, 28mm or 32mm rope in our easy to manage 220m coil. Have a look at our other coloured polypropylene ropes available, in red, orange, green, black, white, and yellow. Get in touch via our contact form or call us on 01692 671721 with any questions or delivery queries.